Reasoning is a game of wits and presence of mind! Yes, it is true and it might seem as the greatest of the challenge after English Section’s surprises but yet this one can easily be dealt with. You just need correct practice and hardwire your brain to quickly make decisions of what to attempt and what to leave. And for same we are providing you questions on Night Class Reasoning Question. 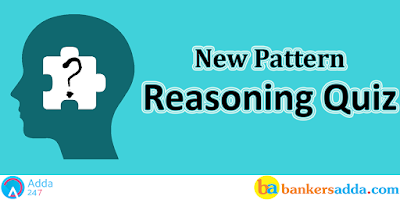 To Practice more with these new pattern Reasoning Question for IBPS PO Exam 2017. The one who is an immediate neighbor of H is facing W. F does not sit at the extreme ends of the row. V and Z are immediate neighbors. Only one person sits between I and G. Z sits second to the left of the person who faces I. E faces the person who is on the immediate left of Z. T sits at the left end of the row. E and H are not immediate neighbours. Q1. Who among the following sits between G and I ? Q2. Who among the following faces G ? Q3. Who among the following sits second to the right of the person who faces U ? Q4. How many persons sits between E and H ? Q5. Four of the following five are alike in a certain way based on the given seating arrangement and hence form a group. Which is the one that does not belong to that group ? No mango is a potato. I. Some vegetable are not potato. II. Some potato are not mango. I. Some sweet are grape. II. some grape are not orange. I. All class being school is a possibility. II. All class are school. I. All set are copy. II. some copy are set. I. Some ring are square. II. All square are ring. Q11. How many such pairs of letters are there in the meaningless word “EMPLOYE” each of which has as many letters between them in the word as in the English alphabet ? Q12. A, B, C, D and E are travelling to a station. Each of them reaches there at a different time. C reaches only after A, and B reaches only before E. Who among them is the third to reach the station ? Q13. What should come in place of question mark(?) in the following series ? Q14. How many such pairs of letters are there in the meaningless word “MANAGER” each of which has as many letters between them in the word as in the English alphabet ? Q15. In a certain code GOLD is written as’54%©’ and BLUE is written as ‘2%@3’. How is BOLD written in that code ?